The Tampa Harbor General Re-Evaluation Study evaluates the widening of Cut B of the Tampa Bay Entrance Channel. The U.S. Army Corps of Engineers, Jacksonville District contracted ANAMAR to collect and analyze multibeam sonar and sub-bottom profile data to characterize hardbottom resources and evaluate the environmental impacts of dredging in the project area. Previous investigations of the area (sidescan sonar and diver verification) indicated the presence of hardbottom resources, some of which appeared to have been exposed by previous dredging activities in the area. The additional acoustic surveys were required to further delineate and characterize these resources by providing high-resolution bathymetric data. A 3-D elevation surface was generated from the data providing a digital model of ecological conditions with regard to habitat structure. These datasets provided a spatial framework for determination of functional habitat and mitigation requirements. Additionally, sub-bottom profile data were used to map the extent of the underlying rock layers in order to estimate the area of rock that will be exposed by construction activities. 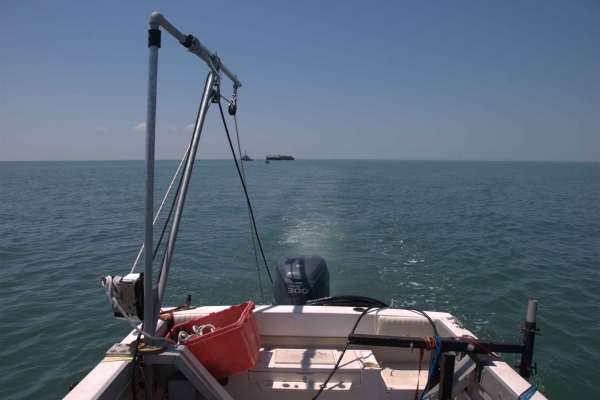 Information from the study was used to determine the environmental impacts of dredging on existing hardbottom resources and to evaluate environmentally beneficial methods of disposal of dredge material and potential relocation of existing hardbottom material to an artificial reef site.